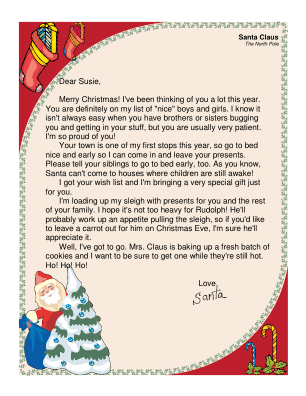 For children with brothers and/or sisters, this printable letter from Santa acknowledges that siblings can be frustrating and praises the child for being patient. Merry Christmas! I've been thinking of you a lot this year. You are definitely on my list of "nice" boys and girls. I know it isn't always easy when you have brothers or sisters bugging you and getting in your stuff, but you are usually very patient. I'm so proud of you! Your town is one of my first stops this year, so go to bed nice and early so I can come in and leave your presents. Please tell your siblings to go to bed early, too. As you know, Santa can't come to houses where children are still awake! I got your wish list and I'm bringing a very special gift just for you. I'm loading up my sleigh with presents for you and the rest of your family. I hope it's not too heavy for Rudolph! He'll probably work up an appetite pulling the sleigh, so if you'd like to leave a carrot out for him on Christmas Eve, I'm sure he'll appreciate it. Well, I've got to go. Mrs. Claus is baking up a fresh batch of cookies and I want to be sure to get one while they're still hot. Ho! Ho! Ho!